The Hotlist, a social aggregator that enables you to find out what’s going on amongst your friends, within your neighborhood, and around the world, this morning announced that the company closed $800,000 in angel financing led by Centurion Holdings, the advisory firm of former UBS Chairman Joe Grano. Funds from the angel round will be used to to launch full mobile integration of its service to consumers (iPhone, BlackBerry and Android apps are on the way) and to support The Hotlist’s platform development. The Hotlist aims to filter information from several online resources based on a user’s preferences and social graph of friends (based on Facebook). It gives users a personalized and instant view of things to do, places to go and people to see within the area. The company’s platform aggregates geo-social data to calculate the popularity of specific events based on their network of friends, enabling users to view detailed venue analytics and ratings so they can manage their social calendar on the spot. The service combs through user-generated data from Facebook and Twitter and combines it with local reviews and listings in Yelp – among other third-party content streams – in an effort to automatically shows what’s going on today, tomorrow and throughout the week among the user’s network of friends. Presented data includes a map of venues and list of friends who will be there and when, past and future event and attendance activity plus real-time venue information and reviews pulled from Twitter feeds. Also handy: guy-to-girl ratio at venues! 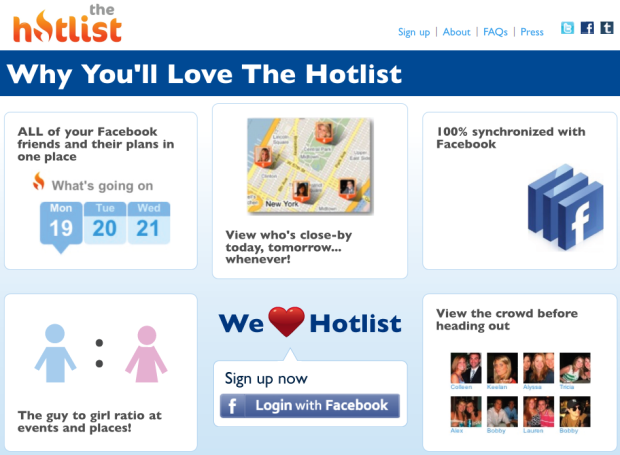 The Hotlist was founded in September 2009 and launched its geo-social aggregator in public beta last March, and currently welcomes around 100,000 unique visitors per month. Already, the company has managed to collect data from over 400,000 venues and 1.2 million upcoming events. The Hotlist was the first undergraduate team in history to win a grant from the NYU Stern Business Plan Competition, giving the company $25,000 in seed funding. The Hotlist is located in the New York City-sponsored 160 Varick Street Incubator as part of Mayor Michael Bloomberg’s business incubator for promising start-ups.